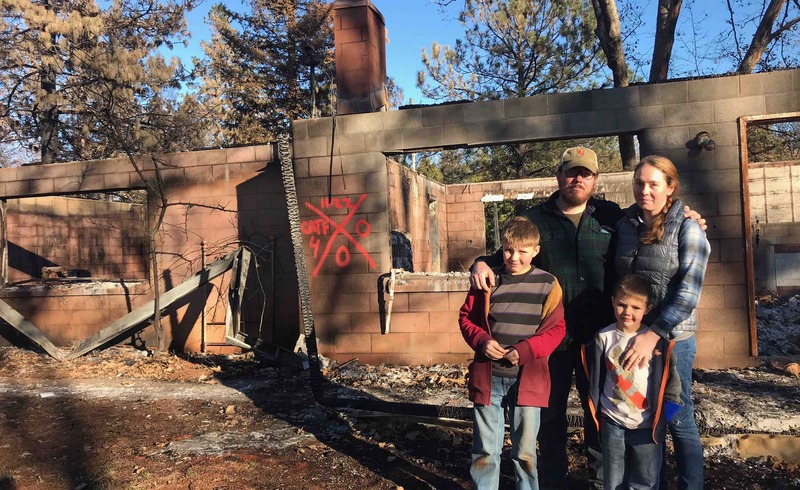 The only word that continues to accurately surmise our family’s situation this last month is “apocalyptic.” The #CampFire in Paradise, CA has destroyed our home, our neighborhood and our entire community. Everyone we know lost their homes, the restaurants we ate at are gone, trails we hiked are no scorched wastelands, places where we shopped are all reduced to smoking rubble. Our mechanic, the woman who cut our hair, all the people that make up a community are all displaced and their businesses are obliterated. We had a firefighter friend take us to our burned home, to rescue our chickens after a few days without anyone to feed or care for them. As we drove through our old familiar streets, the town that once stood, looked worse than even the news reports could full capture. The expanse of the devastation is almost impossible to take in. It’s clear that no one is going “home” any time soon. We are still technically under evacuation and it doesn’t sound like people are going to be let back in for a while. Our family’s old dog Chico still continues to be missing. He was somewhere between 12-13 years old. I got him from the shelter in Oroville when we was between 1 and 2 years old. He was a tough old ranch dog. He protected our animals and our family on a number of occasions. Yet, he was so INCREDIBLY loving and gentle with the boys. The animal shelters don’t seem to have an effective chain of custody in place. We don’t know if he’s out fending for himself, at a shelter or animal hospital, or died a horrible death during the fires. We all choke up every time we think about it. A number of people have searched our yard and his body was not found there. We have talked to all of the shelters numerous times and sent them photos and descriptions. Right now there are somewhere around 12 different facilities caring for dogs. He is also microchipped and we have had our contact information updated. The likelihood of him being found alive diminishes with every passing day. It is heartbreaking to think about what everyone’s animals have been through or how they may have met their end. As former ranchers, the responsibility to be able to provide proper care for the animals you care for is so deeply ingrained in who we are. Kelsey was headed back into the fire specifically for our animals when the canopy of pine trees a few miles from our house exploded in flames and she reluctantly had to turn back. She spent the next 3 hours in a fiery struggle trying to get out through what she could only describe as hell on earth. The first fatalities found were people who died in the cars trying to flee. It’s no overstatement to say that she barely escaped with her life! Beyond our dog, it’s the little irreplaceable things that continue to play over and over in our minds. Kelsey’s wedding dress. An original Leatherman that I’ve had for nearly 20 years. Some bookcases that my dad, a carpenter and custom cabinet builder, made special for me. So many signed copies of books from some of our favorite authors and friends. A pocket watch that my grandparents gave me when I graduated. My grandfather died in January of 2017 and the pocket watch sat on my desk every day right next to his glasses. Handmade quilts from family members. Kelsey’s great grandmothers stand mixer. Canned food that we had been storing up for winter. An antique table that Kelsey’s mom bought as her first piece of furniture when she went to college and then gave to Kelsey when she went to college. A snow village that Kelsey’s grandma bought for her piece by piece and gave to Kelsey over many holidays during her childhood. I had hard drives full of photos and videos of the boys, all ready to go in an emergency – we just couldn’t actually get home. All those photos and family videos are gone. We had lots of old multigenerational photos of family members on our walls that can never be replaced. We have shed our share of tears over the last two days as we have worried about our animals, the irreplaceable keepsakes, and what the future looks like for the town we loved. We are starting this page because we have had so many loving people ask us to start it so that they can share it and know how they can send help. As a family that prides ourselves in taking care of ourselves, it’s difficult to ask for financial assistance but if you can afford to donate money our costs to get through this troubling time will no doubt be significant. Any gift cards would also be greatly appreciated. Prayers, positive thoughts, chants, good juju, encouraging rays of light – whatever you believe in – any and all warm wishes are so greatly appreciated. Since the Campfire in Paradise burned our home, we’ve been staying mostly at my parents’ house in Grass Valley. There just aren’t other good housing options in Chico that we have found for a family of 4. With so many other folks displaced as well because of the fire the market is still pretty crazy. However, that means on school days we have a little over 90 minute drive each way. With road construction projects and all the extra traffic in Chico we’ve been budgeting for a drive closer to 2 hours. It’s not ideal, but we’re blessed to have a place to stay and we have a plan to get back living in the county shortly - more on that soon!!! Today marks the 2 month anniversary of the start of the fire. We're still "feeling all the feels" as the young kids today say. It's sad, scary, overwhelming, liberating and hopeful all at the same time. I want to start by sending the deepest thank you to all of you!!! The demonstrations of love and support that we have received from the community continues to amaze us. As for a more proper update of our situation, I've been elected vice-chair of the Campfire Longterm Recovery Group (CFLTRG) which evolved organically from approximately 70 local, regional and national organizations. This organization's purpose is to bring together key stakeholders from a myriad of entities including non-profit, faith-based, business and other organizations to provide recovery support alongside government efforts. 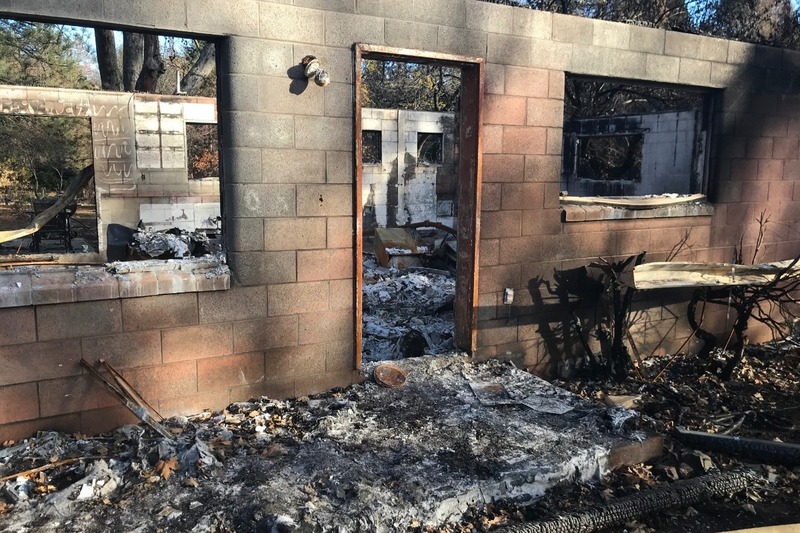 The recovery group is modeled after similar disaster recovery groups formed in Sonoma County after the Tubbs Fire of 2017, and other natural disaster response groups that have emerged after disasters like Hurricane Katrina and Sandy. Additionally, I'm bringing my global work on regenerative and holistic outcomes home in new ways. This happening both through the CFLTRG and other initiatives, exploring what a truly regenerative future for a town like Paradise would look like. It's interesting to allow oneself to transcend the pain and challenges and instead really embrace the level of opportunity that exists, after the disaster, in rebuilding and entire town and re-cultivating a thriving community. We're very hopeful for the future and we are planning to rebuild in Paradise. We are currently still house-hopping, staying with old friends, family, and new friends. We are hoping to get into a travel trailer in the next couple of weeks. We want to be able to stay mobile and flexible without overly investing in what will only be a short term solution. Kelsey and I are both back at work, after the holidays, at the Savory Institute and CCOF. We have been so blessed by our work-families on so many levels! We are excited to get deeply back to the work we love so much! Chico News & Review wrote an article this week about our housing situation and work with the CFLTRG if you want to check that out. I know we owe so many of you texts, emails, phone calls, hugs, thank you cards. We have been overwhelmed by all there is to get back on our feet but in total awe of all the kindness that has been poured out on us. Please know we hear you, we love you, and we are eternally grateful for your support, and we will do our best to follow up soon. It’s been 38 days since the fire. In some ways, it feels like just yesterday that the community-obliterating-disaster happened and in other ways it feels like an eternity. The unique challenges, confusion and despair felt this last month are unparalleled in so many ways by anything Kelsey or I have experienced in the past. As we reflect over the last 6 weeks, we realize that we’ve stayed in 9 different locations since the fire. A new normal has yet to emerge for us. Each day has involved getting up dawn and running a sprint-marathon until late in the evening. It’s counterintuitive to think there would be so much to do when we have so little, but every day has been filled with the tasks of trying to rebuild our lives, packing/unpacking suitcases, trips back and forth to our new storage unit, filling out paperwork, making phone calls and driving to various functions that require fire-victims to be there in person to receive aid items and information. Despite all this, it feels like so little has actually been accomplished. A couple of weeks ago, the evacuations were lifted for houses off Pentz Rd. We got to go see and experience our former property first hand. We spent a few days digging through the ashes. As we went through the mire, we found some novel items but nothing of real significance. 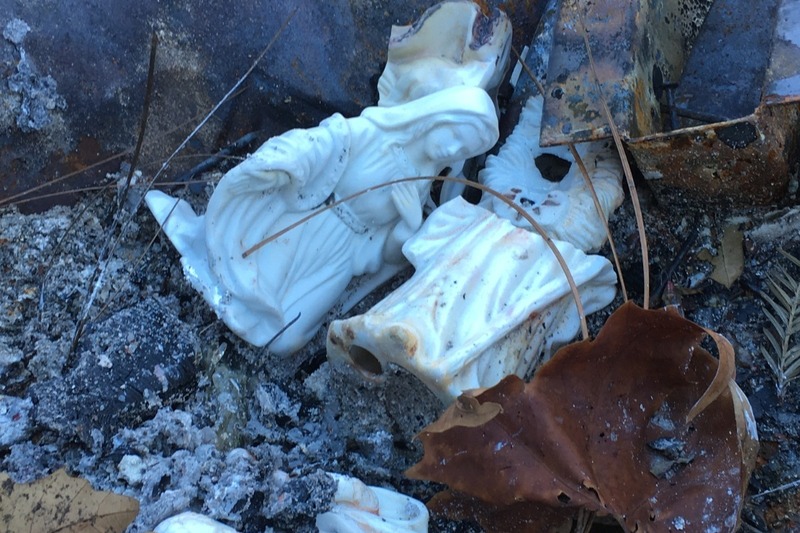 The fire burned so hot that even glass and metal melted, and porcelain items became brittle shells, instantly crumbling when touched – once again the destruction was comprehensive. Even our cast iron pots and pans warped and contorted. There just isn’t much for us to find. In many ways, we simply needed the time to walk the footprint of our former abode and say goodbye to the home we loved SO much. Every day we continue to process our feelings around this disaster. There are large chapters to go through like the loss of the dog and when we realized that neighbors died on our street, just a few hundred yards from our front door. These meta-level events hit like a sledge hammer and are always front of mind. Then there are the smaller pieces that feel like death by a thousand papercuts. Each day we think of things that were important to us that we don’t have anymore. The challenges are exacerbated by the holiday season. With no real permanent place to call home, we have no Christmas tree or decorations up. Even prior to the fire, we have been so acutely aware that every Christmas with the kids is precious – the years go by so quickly. I can’t believe Danny is already 11 years old. This will without a doubt be the last year that he believes in Santa (he’s already skeptical) and in so many ways it feels like the last year of his childhood. He’s growing up. As the days march in, one of the things I miss most are how the kids used to crawl into our big bed most mornings and we'd talk about our plans for the day. Since we’ve been displaced, that habit has not yet really re-emerged yet. I find myself craving those special moments every day. Little by little, it’s starting to set in how much our lives have changed. Overall though, the boys are doing surprisingly well. They are still by and large enjoying the long-term “camping trip” with friends and family. However, they are digesting the horror in their own way. Daily they mention the dog, things they miss doing at our old home, and favorite items that are now gone. Kelsey and I put a tremendous amount of intentionality behind monitoring and bolstering their emotional health. We work to insulate them from the brunt of the challenges and then help them talk through the doses of reality that we can’t keep from them. We had a particularly low moment this last week. We put an offer in on a house, before we had even been able to do a walkthrough – all we had to go off was pictures from the online listing and what we could see from peaking in windows. It was a 40 minute drive from the boy’s school – much further than we would have normally ever considered, with fewer bedrooms than we need, and in a more crowded neighborhood than we would have previously every looked at. We wanted to be taken seriously so we worked with our agent to draw up an offer that was $15K higher than the asking price and ensured the seller that we would pay a higher rate than the appraisal of the house. Some family members offered us a loan to put a rather large cash down on a house. Despite these things, our offer was instantly rejected as not being enticing enough. 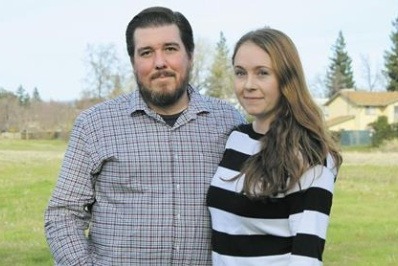 The seller’s agent said they planned to keep the house on the market until the frenzy was at a peak, in other words until the short-term lodging with friends and family had worn off and people realize how desperate they really are. It made me sick to be a part of the whole interaction. It’s hard to explain but it feels like the fire continues to take from us. 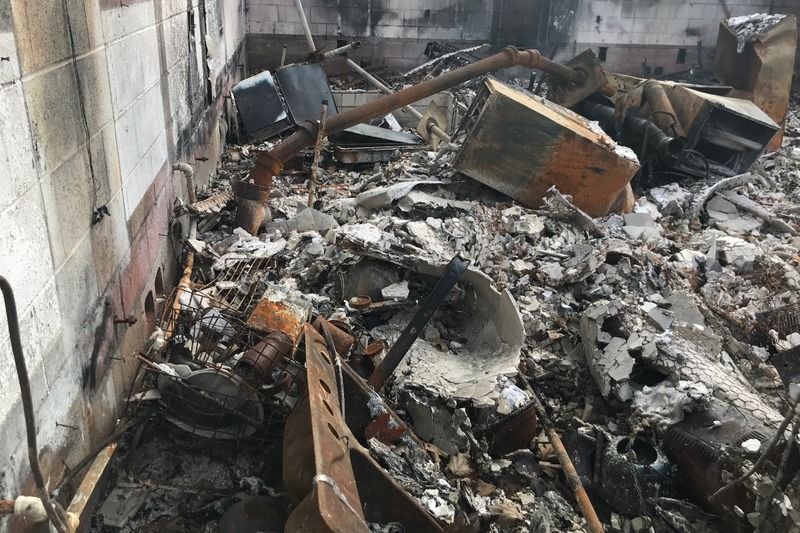 We ran into our neighbor the last time we were at our old house, and he said sarcastically but oh so poignantly, “the fire is the gift that keeps on giving.” Kelsey and I continue to replay the fateful events of November 8th over and over, wondering how we could have done things differently. It’s a haunting vicious circle that can’t really be solved but we can’t seem to put it to rest yet either. Every day though we remind ourselves to stop and count our blessings. Despite our tough situation, we recognize that there are still so many struggling and grieving larger losses. We are constantly looking for opportunities to pay the kindness that has been so graciously bestowed on us forward, and help others, as our community works to take on a new shape. And we owe a HUGE thanks and again want to give a a shout out to our employers the Savory Institute and CCOF who have been so incredibly generous and understanding during these difficult times. We also are so appreciative of the countless offers we’ve had to move to new areas, even different countries and restart our lives there. For a number of reasons though, we need to stay in Butte County. And our hearts are in Paradise. Kelsey and I want to be back at ground-zero and playing an active role in the rebuilding process. We need to find a long-term temporary residence close to The Ridge (what our area is a colloquially called). We’re not sure yet if that will be FEMA housing, a travel trailer or yurt, purchasing a home further up in the mountains, or exactly what just yet. We are having to get comfortable with being uncomfortable and not knowing what structure will house our future. We went back to the house today. We found the dog, he ran into the garage and hid under my work bench where he burned. I’m so beyond sad!!!! I really believed we’d still find him alive.